Spice Set for Gin Tonic Stylish “Stack box” with 4 spices to refine Gin Tonic. Simply put it into the glass, let it go and enjoy! Enough for about 10 servings. The Botanicals are delivered in the chic “stack-box” of acrylic glass with four individual compartments. Due to the screw mechanism, the aromas are maintained for as long as possible and do not mix with the other spices. Contains: Juniper juniper comes from Eastern Europe, tastes sweetish-sour, slightly resinous-bitter and smells very strong. By drying the juniper berries get their bluish-black color. Juniper is an ancient medicinal, spice and also magic substance. We recommend 4-5 berries per glass. Hibiscus Hibiscus is harvested in tropical regions and finds its origin in Asia. The dried hibiscus blossoms provide an optical highlight in your gin-tonic. After only a few seconds, the liquid turns pinkish-red. The addition of 2-3 flowers add an extra flowery-fruity taste note. Cardamom All the green cardamom capsules are from Guatemala. The spicy-sweetish aroma reminds a little of eucalyptus. The subtle sharpness is due to the fact that cardamom comes from the family of ginger plants. We recommend 3-4 capsules per glass. Pink pepper Pink pepper comes from South America, grows on pepper trees and is fantastically aromatic. 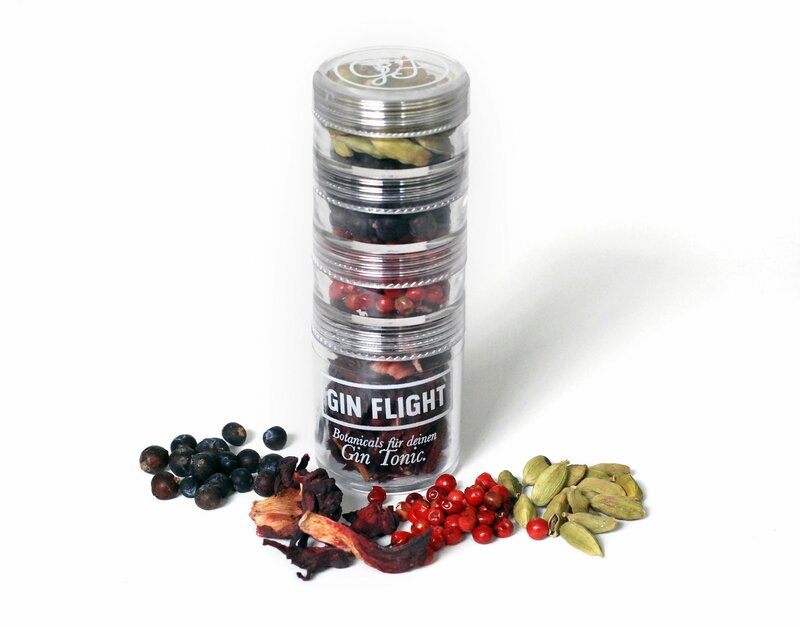 Although the grains have an intense fruity pepper-flavor, give the gin-tonic a discreet sharp note in the finish. We recommend 4-5 grains per glass. Contains: 3g Juniper, 3g Pink Pepper, 3g Hibiscus, 3g Cardamom Fits perfectly: Monkey 47, Bombay Sapphire, Nobody Dry Gin.